This is a superb modern and stylish villa which is highly recommended by the Elegant Address team. 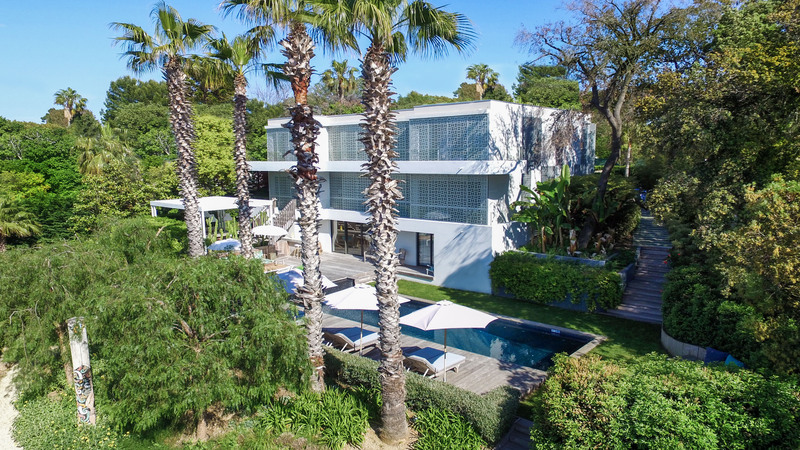 Located in a prestigious area on the west side of Cap d’Antibes just a short 2 minute walk from the famous Hotel du Cap Eden Roc and close to all of the excellent beaches, restaurants, shops and nightlife of Juan les Pins and Antibes. This is a superb location for this very comfortable and stylish villa. 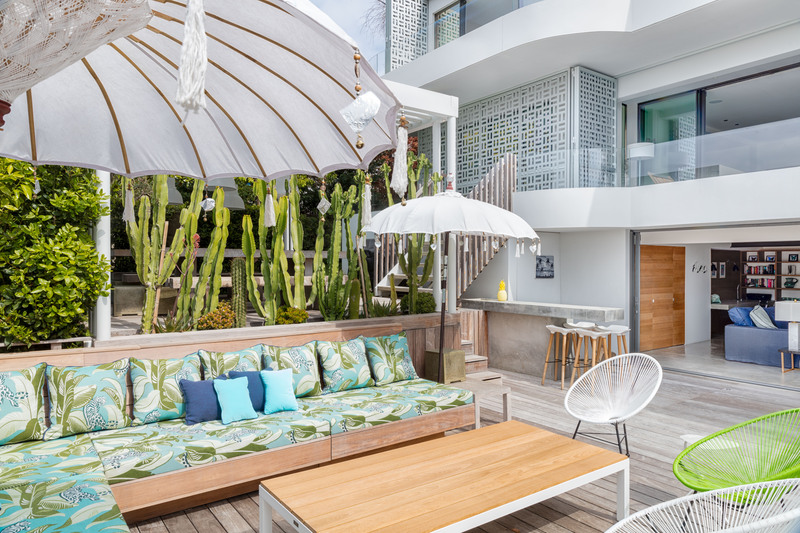 This lovely new villa offers modern and contemporary living with bright and interior spaces that seamlessly blend with the terraces to afford guests outdoor/indoor dining and living areas. The villa is punctuated with Indonesian antique artifacts and furniture, and iconic modern classics. The entrance to the property is through a large coded metal gate which allows parking for 3 cars under the vine-covered portico to the side of the house. An antique Indian door to the left leads to the black bamboo planted garden and the swimming pool outdoor area. 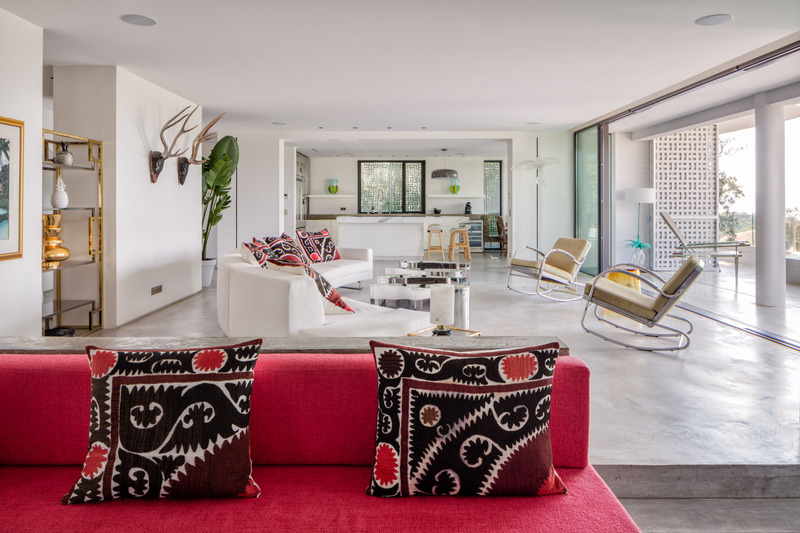 The ground floor is an open plan living area with a beautiful polished concrete floor. 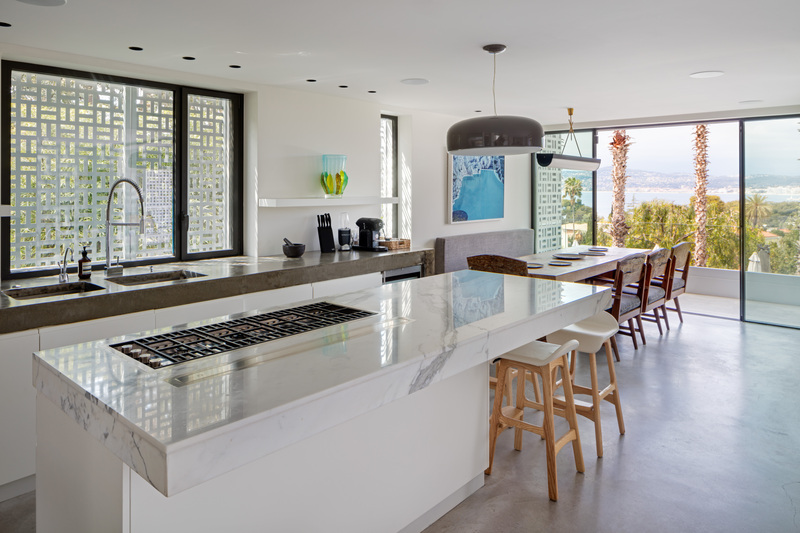 On one side there is the kitchen with a central cantilevered marble island, Gaggenau appliances and dining area for 12, then a stylish central salon leading to a more intimate dropped down TV area/library/study with wooden oak floor, further seating and a large fireplace. 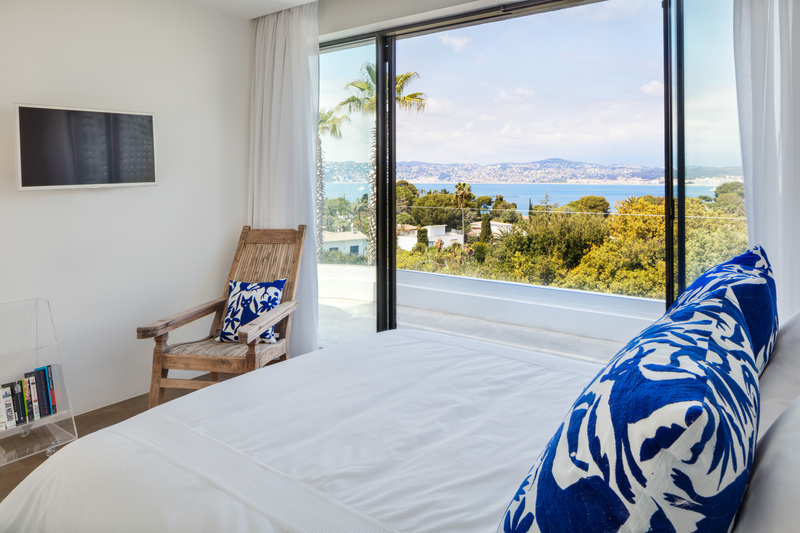 All of these living areas have floor to ceiling sliding doors that open fully onto a continuous polished concrete terrace, which allows magnificent views of the garden with its 5 metre palm trees, pool area and animated scenes of the bay of Golfe-Juan and Super Cannes. This floor also accommodates a guest toilet, cloakroom and separate housekeeper studio including laundry. The housekeeper has a separate private front entrance. On the first floor is the spacious master bedroom suite with super king (200cm bed), walk-in walnut dressing room, marble paneled shower area and bath tub. The glass sliding doors open again on to a continuous polished concrete terrace allowing guests views of the sea. The further 4 bedrooms on this floor all have their own ensuite shower rooms clad in floor to wall shades of grey Bizassa tiles and walnut paneling. The beds are queen size (150cm) and all bedrooms have ample built in wardrobes and TV’s. 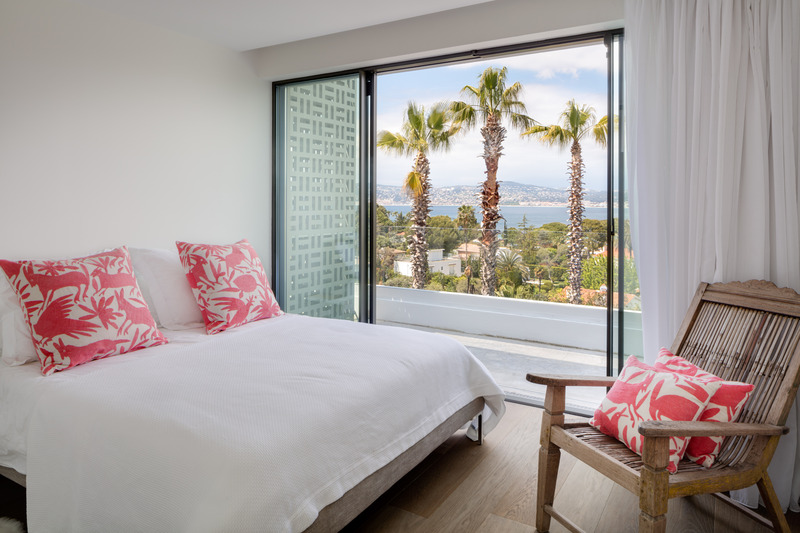 Furthermore the north facing bedrooms enjoy the views of the sea, and the south facing bedrooms open onto a small terrace. The 6th bedroom suite is to be found included in its own floor at the pool level. With separate access from the main house, this large bedroom suite with super king-size (200cm) bed, walk in wardrobe, TV and large opaque glass walled en-suite shower room allows ultimate privacy and direct access to the pool area. The bedroom opens onto a large salon with big screen TV, a cantilevered polished concrete desk/study and oak paneled library wall. 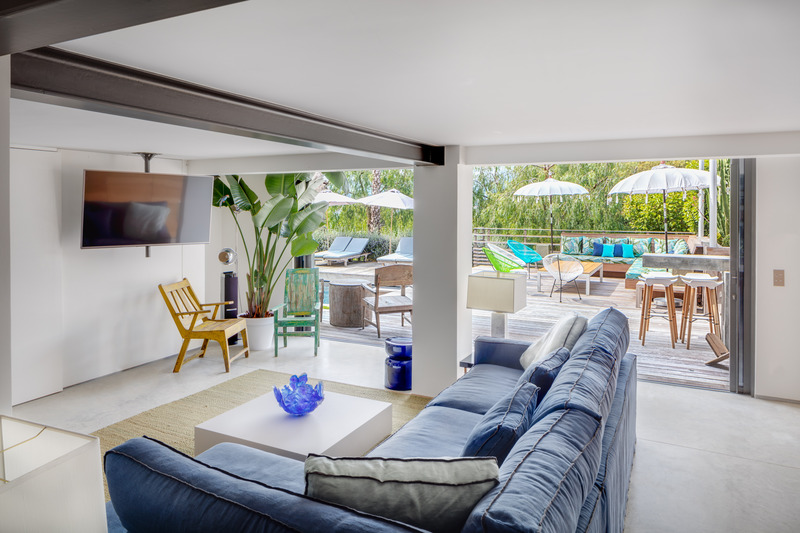 The sliding doors open completely to allow continuous flow onto the wooden decks surrounding the pool. A further guest toilet and marble clad shower room serve this floor and the pool area. All rooms enjoy a continuous thread of luxurious textiles and an eclectic collection of furniture and artifacts from the Indonesian Islands to modern day design classics and special collectible items. The entire house is clad in a special perforated aluminium shutter design allowing for light and air to enter yet providing an extra level of security. A series of decks are accessed from steps leading off the ground floor terrace. On one there is a large eating area with 2 large solid teak tables which can accommodate parties of 20 guests where alfresco dining can be enjoyed to the full. The next level down leads to the pool area with is black tiled pool, cascade and integrated Jacuzzi. 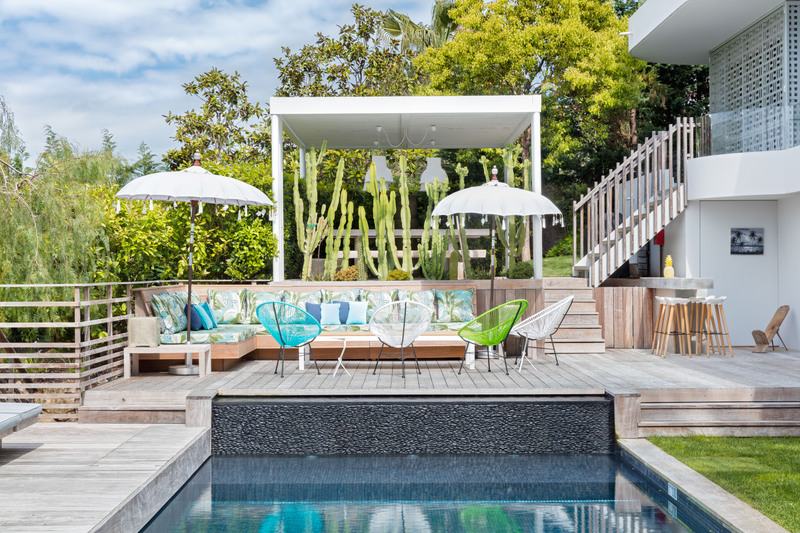 On one side of the swimming pool there is a shaded daybed lounging area alongside an integrated concrete outside bar and fridge area, and a curved seating area to the far side of the pool surrounding an open gas fire pit.